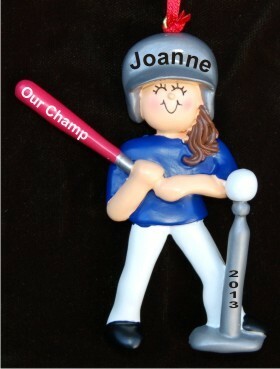 Whether she knocks it over the fence or hits the tee on most swings, your little slugger will smile brightly when she pulls the tee ball female brunette personalized ornament from our classic velvet pouch. As one of our sports ornaments personalized for the recipient, this one arrives with her name and other details you provide. Celebrate her participation on the diamond with the charming and sporty tee ball female brunette personalized Christmas ornament from Russell Rhodes.